It started with an old fashioned apple crate with a piece of plastic cutting board backlit with rope light. Four raspberry cartons each contain an artifact or an assembly of artifacts. My favorite is the green sipper straw snaking through the breast-shaped acorns with a background of suggestive German Sci-Fi comics. 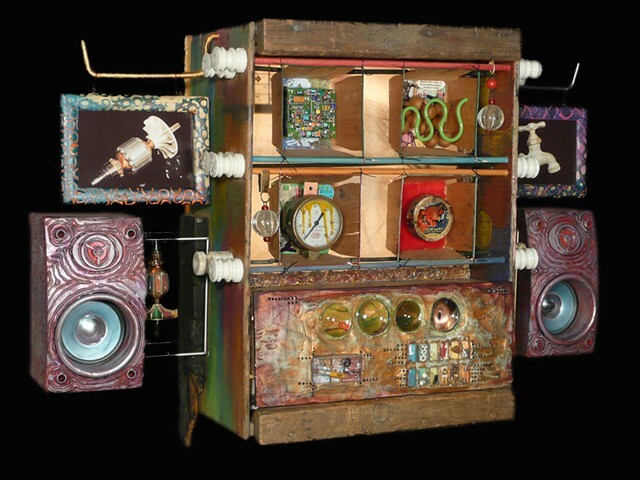 Between each speaker and the apple crate are painted artifacts: an AC motor armature and a water faucet. Photos of the original untainted artifacts hang in the frames on either side. The lower section holding the CD player and power supplies has a surface of Hydrocal (tm), a modeling clay I used before I discovered indoor tile cement. (Thanks to Michael Horswill!) Embedded lenses, a blister pack for audio cables and a clear plastic gum container allow the viewing of secrets inside. The sides are finished with oil pastels and the porcelain insulators were added for rustic sensibility. In2013, Steve lost the Laughing Cow box so it got replaced with the TI color wheel from a DLP video projector. From the collection of Ruby Devine and Steven Schneider.